New systems monitored by U.S. intelligence agencies under development or in the deployment phase include an advanced S-500 missile defense system currently being built in addition to the already available, and very capable, S-400 and S-300 defenses. Additionally, the Russians are upgrading the SH-08 nuclear-tipped anti-missile interceptors that have been deployed around Moscow for more than two decades. Other new Russian defenses with capabilities against both aircraft and missiles include SA-20 and SA-21 surface-to-air missiles, and a new advanced system called the SA-X-23, an advanced version of the S-300. U.S. officials said the defenses are assessed as effective against cruise missiles, bombers, jet fighters, short- and intermediate-range ballistic missile, and intercontinental ballistic missiles. Disclosure of the Russian missile defense buildup comes as the Obama administration is seeking to reach an agreement that critics say could result in legally binding restrictions on U.S. defenses. There are also fears an agreement with Russia will compromise classified technical data on missile defense that the administration is considering sharing with Russian officials. One official said the administration is suppressing evidence of the Russian defense buildup. Instead, the White House is pressing ahead with questionable missile defense negotiations with Russia that are aimed at mollifying Moscow’s concerns that U.S. and NATO defenses are covertly aimed at countering Moscow’s strategic arsenal. A second official said the Russians recently began announcing publicly a large-scale modernization of their missile defenses. "What gives?" this official asked. "Why is the United States kowtowing and trying to please the Russians over their concerns about our missile defenses, and no one ever says anything about their missile defenses?" In talks with the Russians on missile defense, Obama administration negotiators have not proposed that the Russians limit their missile defenses as part of any agreement, the officials said. Russian President Vladimir Putin this week met with top officials, including the defense minister, chief of the military’s general staff, deputy defense minister in charge of armaments, and commanders of the military branches. A presidential spokesman told Interfax the meeting was "dedicated to problems of the development of new missile defense systems and to issues of counteracting the existing systems." Arms control advocates have argued that missile defenses upset strategic stability and complicate efforts to reduce strategic offensive arms. But if that is the case, "why is Russia doing it and why are we letting them do it," the second official asked. If that logic is correct, "the Russians are merely getting us to disarm our defenses and disarm our offenses and shame on us," he added. Additionally, a Russian press report published Wednesday said President Barack Obama proposed in a recent letter to Putin that the United States and Russia conclude a legally binding agreement on exchanging information about missile defenses with the goal of "guaranteeing the absence of a mutual threat." The report was carried in the Kommersant Daily. White House spokeswoman Caitlin Hayden had no comment on the Russian report. "We generally don’t comment on the content of the president’s correspondence and we won’t this time," she told the Washington Free Beacon. Disclosure of the letter followed Republican congressional opposition last week to revelations that the Pentagon has held internal discussions on declassifying missile defense technical data that could be shared with the Russians. Rep. Mo Brooks (R., Ala.) and Sen. Mark Kirk (R., Ill.) said last week they opposed any sharing of missile defense data, warning such exchanges would undermine U.S. national security and compromise missile defenses developed at the cost of hundreds of billions of U.S. taxpayers’ dollars. Thomas Moore, a former strategic affairs specialist with the Senate Foreign Affairs Committee, said Russia plans to create a vast air and missile defense architecture in and among states of the former Soviet Union under the Collective Security Treaty Organization. 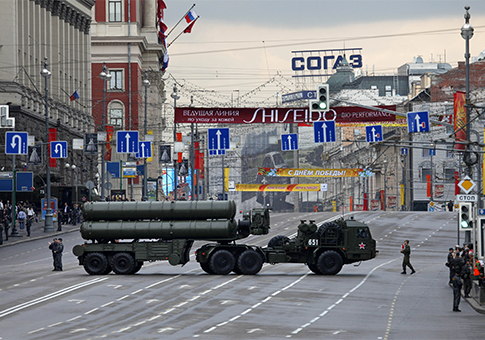 "Its recent announcement of the S-300 [air-missile defense] deployments to Belarus are an indicator of things to come," Moore said, noting that open source reports indicated Moscow has developed a nuclear warhead for the S-300. Russian Foreign Minister Sergey Lavrov linked the Belarus deployments to what he said was a violation of an agreement limiting NATO expansion in the 1990s. "We can wonder aloud why Russia feels the need to make these threatening gestures, but with no real NATO missile defense architecture in Europe, I think the Russians are going to continue to use NATO air and missile defense improvements, or even the hint of future improvements, as an animating factor for most of their arms sales and defense cooperation," Moore said. "The final phases of this cooperation will result in a new Warsaw Pact, of sorts," he said. "It doesn’t take much imagination to see that if one phase of this is some new Warsaw Pact, the next phase will be some new ABM Treaty." Jack Caravelli, a former CIA analyst now with the LIGNET strategic intelligence group, said Russian interest in expanding air defense and missile defenses is part of a larger, across-the-board effort by Putin to enhance strategic military capabilities that was announced during last year’s presidential campaign. "Russia has the technical capabilities and decades of experience to develop robust defensive capabilities at the same time the Obama administration is pondering even deeper cuts in its strategic forces, on top of the New START Treaty signed with Russia several years ago," Caravelli said. Russia is also developing and deploying a new generation of long-range missiles, upgrades that will result in a more modernized force than any systems the United States will be able to match for at least two decades, he said. "Russia’s planning for enhanced defensive and offensive forces almost certainly also is a reflection of a desire to keep apace of China’s growing investments in strategic offensive capabilities," Caravelli said. John Bolton, former undersecretary of state for Arms Control and International Security, said reports of Russian missile defense modernization are troubling. "If the Russians are indeed improving their existing defenses, while simultaneously leading the Obama Administration down the primrose path of negotiations, it would fittingly embody the president's naiveté in foreign affairs," Bolton said. "Moscow must be looking forward to even more ‘flexibility’ from Obama, as he promised Russian President Medvedev last year." Obama was overhead during a discussion with Medvedev in Seoul saying he would have "more flexibility" in talks on missile defenses after his presumed reelection in November. The Russians are continuing to demand legally binding restrictions on U.S. missile defenses as the price for dropping opposition to planned deployments of SM-3 missile interceptors on land in Europe. Those defenses are being planned in phases over the next several years amid concerns that Iran is on the verge of developing long-range missiles. Frank Gaffney, a former assistant defense secretary in the Reagan administration, also sounded the alarm about the current administration’s negotiations with the Russians. "The Kremlin, going back to Soviet days, has always believed missile defenses were not simply legitimate but necessary for protecting at least its priority assets and populations," Gaffney said. The Russian military pursued the development and deployment of such weaponry without interruption "including and notwithstanding its obligations under the 1972 Anti-Ballistic Missile Treaty," Gaffney said. "The Kremlin has, however, been at least as determined to prevent us from doing the same, using negotiations, coercion, and offensive missile enhancements to keep us vulnerable to their attack," Gaffney said. "We indulge the Russians further in this double-game at our extreme peril." This entry was posted in National Security, Politics and tagged Barack Obama, Obama Administration, Russia, Vladimir Putin. Bookmark the permalink.